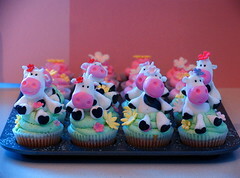 Cow & flower cupcakes for a 1 year old! Prototype...still in progress! 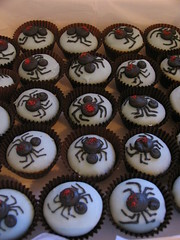 For a cupcake! This photo has been photoshopped for a poster. 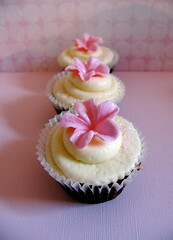 Pink hand made edible flowers for my basic Breast Cancer cupcake range (they are co-ordinated with ribbon cupcakes). 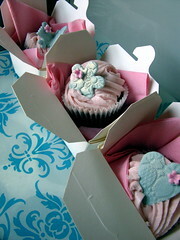 Lace Embossed cupcake decorations are catching on fast.....ever since I've had them on a couple of cupcake sites!! Now they're popping up everywhere...so it's nice to see people being inspired by something new! 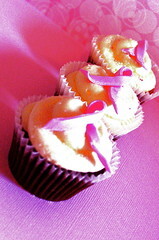 "Powerhouse Museum" of Sydney afternoon tea event!! 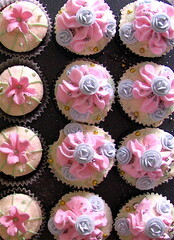 My Cupcake used for the Ad for the "Powerhouse Museum" of Sydney afternoon tea event!! I was very honoured to be asked to host a half hour demonstration on cupcakes by Joanna Saville - a food writer & of TV fame!! 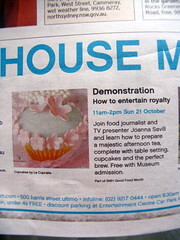 I was even more honoured that they chose my cupcake photo to be used on the advertisement..that apeared in the Spectrum section of the Sydney Morning Herald on Saturday! !